The word almanac has been linked with farmers for hundreds of years. When Robert B. Thomas began issuing his Farmer’s Almanac in 1792 (he added the word “old” in 1798), for example, the idea of getting a grip on the vagaries of weather was its most compelling selling point. Like other almanac publishers, he added tips, shortcuts, quotes and witticisms mostly to fill columns of weather charts that weren’t quite fitting properly. Over time, as Americans began moving off their farms, the “useful tips, shortcuts and secrets” sections of some almanacs began to overtake the weather predictions because of reader interest. Almanacs continued to evolve. In 1888, we needed household help with things like how to make fruitcake last a year or how to keep our crepe de chine waists white. More than a century later, our lifestyle-savvy toolbox includes advice on home filing systems, storage of digital family photos, how to clean an AC system, or how to reclaim a garage. Nevertheless, we still need to know how to employ the same basic tenets that have always been an integral part of small farming communities: things like frugality, efficient use of resources and neighborliness--the kinds of things that are part of the Costco community, what I call the “Costco way in the world.” It’s a vision of a future that includes recognizing the need to live in a more global economy while still maintaining a family atmosphere and investment in our communities—in short, to conduct commerce on a high moral plane. 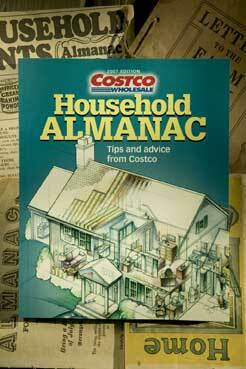 The Costco Household Almanac sows the seeds of “everything community”--from how to start a book club to preparing for a weather-related disaster, to improving your health, to filtering your water, to kicking a cigarette habit. It’s the modern-day version of age-old helpful hints, homemade concoctions and darned good reading. A good way to preserve flowers in bloom and keep them erect is to cut a flat surface on the long side of a raw potato and then stick the stems into holes bored into the top side using a pointed potato peeler. There is moisture enough in a large potato to support a bouquet of flowers! May this 2007 Costco version of a tradition that has played an important part in our nation’s history help you put better food on your table and “sparklin’ white linens” on your line! Let the old-time ways become the new-time ways. Carpenter, waitress, janitor, upholsterer, secretary, ranch hand, milkmaid, wilderness ranger, environmental activist, entrepreneur, and owner of MaryJanesFarm in northern Idaho, MaryJane Butters has worn many hats (and aprons) in her day, but none more proudly than that of modern-day farmgirl. She is the author of two books, MaryJane’s Ideabook, Cookbook, Lifebook and MaryJane’s Stitching Room and manages the “Farmgirl Connection,” a Web site (www.maryjanesfarm.org) that brings together thousands of women, both citified and countrified, to share their farmgirl dreams and big farmgirl hearts.